[S1752] Mrs. Bula A. Holland, South Carolina Death Certificate - Mrs. Bula A. Holland. Her married name was Bagwell. Margaret (?) married Hays Bagwell, son of Littleton Bagwell and Elender (?). Wiley Hays Bagwell was born on 12 August 1800 in Spartanburg, Spartanburg County, South Carolina.1 He was the son of Hays Bagwell and Margaret (?) 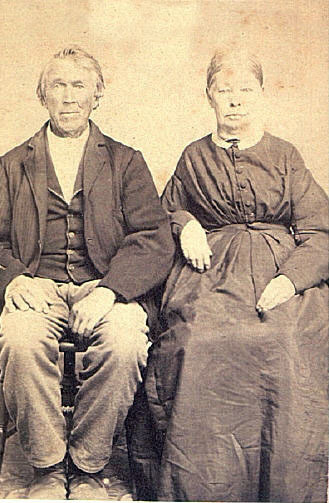 Wiley Hays Bagwell married Elizabeth Leffler on 28 June 1821 at Boone County, Missouri. Wiley Hays Bagwell married Rebecca Taft before 1834. Wiley Hays Bagwell died in 1836 in Spartanburg, Spartanburg County, South Carolina. [S347] William Bagwell Grave Stone, Find a Grave, www.findagrave.com. [S422] U.S. General Land Office Records, 1796-1907 Document No. : 31188 ; Accession No. IN3240__.333, United States Bureau of Land Management. [S348] Elizabeth E. Bagwell Grave Stone, Find a Grave, www.findagrave.com. Rebecca Adaline Bagwell was born on 5 January 1825 in Parke County, Indiana. She was the daughter of William Bagwell and Elizabeth Elliott Martin. As of 20 February 1849,her married name was Cooper. Rebecca Adaline Bagwell married William Cooper on 20 February 1849 at Parke County, Indiana. Rebecca Adaline Bagwell died on 4 November 1920 in Parke County, Indiana, at age 95. She was buried at Blue Ridge Cemetery, Raub, Benton County, Indiana. William Cooper was born in 1825 in Kentucky. He married Rebecca Adaline Bagwell, daughter of William Bagwell and Elizabeth Elliott Martin, on 20 February 1849 at Parke County, Indiana. William Cooper died in 1880. Married Levi H. Mowrer on October 8, 1850 in Rockville, Parke County, Indiana. The Mowrer family came to White County about 1850, and settled in the partially developed region of Union Township. In that township James Mowrer was born, February 10, 1854, a son of Levi H. and Matilda J. (Bagwell) Mowrer. The Mowrers are of German descent, as is indicated by the present form of the name, and came West from the State of Pennsylvania. Levi Mowrer married Miss Bagwell in Indiana, and she was of Scotch-Irish decent, her ancestors having lived for a number of years in Southern Indiana. To Levi and Matilda Mowrer were born five children: Joseph, now deceased; James; Rudolph; Mary, wife of William Fisher, of Winamac; and Daniel. Levii Mowrer was a republican but did his part in the world as a good citizen without holding office. He was a farmer and stock raiser, and owned sixty acres of land, which he subsequently sold, and had been retired for several years before his death on October 9, 1898. His wife passed away July 30, 1879. They are at rest in the cemetery by the old Brethren Church. The mother was a member of the German Lutheran Church. Source: A Standard History of White County, Indiana: An Authentic Narrative of the Past, with an Extended Survey of Modern Developments in the Progress of Town and Country. She was buried at Pike Creek Church of the Brethren Cemetery, White County, Indiana. Levi H. Mowrer was born circa 1824 in Pennsylvania. He married Matilda Jane Bagwell, daughter of William Bagwell and Elizabeth Elliott Martin, on 8 October 1850 at Parke County, Indiana.1 Levi H. Mowrer died circa 1880 in White County, Indiana. John Wilkie Bagwell was born on 2 May 1830 in Parke County, Indiana. He was the son of William Bagwell and Elizabeth Elliott Martin. John Wilkie Bagwell married Margaret Low on 13 November 1851 at Shelbyville, Illinois. John Wilkie Bagwell died on 12 January 1894 in Jasper County, Illinois, at age 63. Her married name was Bagwell. Margaret Low was born in 1834 in Iowa. She married John Wilkie Bagwell, son of William Bagwell and Elizabeth Elliott Martin, on 13 November 1851 at Shelbyville, Illinois. John S. Bagwell was born on 16 December 1854 in Chariton County, Missouri. He was the son of John Wilkie Bagwell and Margaret Low. John S. Bagwell married Mary Viola Snearly on 28 October 1880 at Jasper County, Illinois. John S. Bagwell died on 23 July 1937 in Lawrence County, Illinois, at age 82. Mary Viola Snearly was born on 24 February 1862 in Chariton County, Illinois. 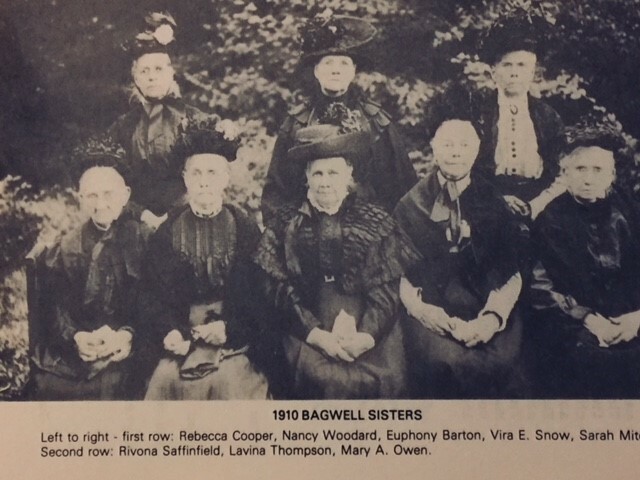 As of 28 October 1880,her married name was Bagwell. She married John S. Bagwell, son of John Wilkie Bagwell and Margaret Low, on 28 October 1880 at Jasper County, Illinois. Mary Viola Snearly died on 5 September 1943 in Sumner, Lawrence County, Illinois, at age 81. She was buried at Sumner Cemetery, Sumner, Lawrence County, Illinois. Flora M. Bagwell was born on 12 August 1881 in Jasper County, Illinois. She was the daughter of John S. Bagwell and Mary Viola Snearly. As of 12 June 1895,her married name was Brownfield. Flora M. Bagwell married William Brownfield on 12 June 1895. William Brownfield married Nancy Fulton. William Brownfield was born in 1863 in Jasper County, Illinois. He married Flora M. Bagwell, daughter of John S. Bagwell and Mary Viola Snearly, on 12 June 1895. William Brownfield died in 1942 in Jasper County, Illinois. Her married name was Brownfield. Nancy Fulton married William Brownfield. Nancy Fulton was born in 1862 in Indiana. William Brownfield was born in 1907 in Illinois. He was the son of William Brownfield and Nancy Fulton. Ethel Beavers was born in 1904 in Illinois. She was the daughter of Ralph A. Beavers and Lenna L. Bagwell.